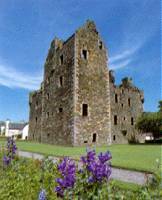 A castellated town house, complete except for its roof, Maclellan's Castle was built by the then provost of Kirkcudbright, Thomas MacLellan of Bombire, in the 1750s, but probably never finished. The remains of this noble residence demonstrate how architecture evolved from the heavily defended tower house to a new more domestic, if grand scale. In the centre of Kirkcudbright on the A711.